An overview of the history, peoples, religions, and influential organizations of the lands of Tal'dorei! A comprehensive gazetteer of Tal'Dorei's regions and settlements, complete with major characters and factions, and a wealth of adventure hooks! New hero archetypes, feats, wondrous items, and rules for use with 5th Edition, including the Vestiges of Divergance! New monsters and adversaries to test the mettle of your players, like the cinderslag elementals, cyclops stormcallers, and the fearsome ravagers! A huge 17" x 22" poster map of Tal'Dorei by cartographer extraordinaire Andy Law. Will you find one of the revered Vestiges of Divergence or perhaps discover part of the Chroma Conclave's legacy? Can you help the Ashari in their sacred charge to prevent the elemental vortices from overwhelming the world, or will you find yourself embroiled in the machinations of the Clasp? 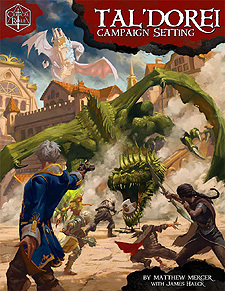 All this and more awaits you within the Tal'Dorei Campaign Setting!